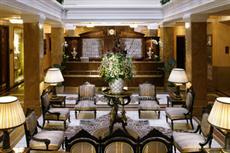 The Sacher Salzburg is located in the heart of the city on the Salzach Promenade. This five-star hotel is within walking distance of many famous places of interest, including the Mozart museum, art museums, festival halls, the Marionette Theatre, the Mirabell Gardens, the Salzburg Cathedral, St. Peter's Abbey, and the Getreidegasse. The Salzburg airport is located in close proximity to the Hotel Sacher Salzburg. A shuttle service is available upon request. Taxi services and public transportation are also easily arranged. Many attractions are within walking distance, and bicycles may be rented for the many bike paths throughout the city. Each of the Hotel Sacher in Salzburg's well-appointed rooms offers an en suite bath with complimentary toiletries, bathrobes, and hair dryers. Satellite flat screen televisions, mini-bars, and high-speed Internet can be found in every room. Most guest rooms offer separate sitting areas. Many luxury amenities are available at the Sacher in Salzburg, including a piano bar, a restaurant, the Sacher Café, and a well-appointed fitness center with a sauna, solarium, spa services, and steam room. Childcare, valet, laundry, and concierge services are all available upon request. Business travelers will find ample meeting space, as well as high-speed Internet connections.